A skipjack tuna, another warm water fish, has been observed in Alaska waters. “It was interesting to find it,” said Gary Johnson, a fish buyer for Yakutat Seafoods. Johnson said he and some friends were driving along the beach, looking for glass balls and beachcombing during their day off on Sept. 7. 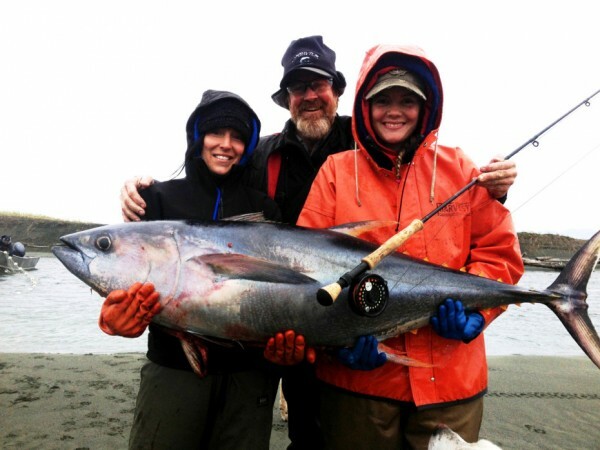 He spotted the 5-pound tuna as they headed toward Seal River, a little over 10 miles west of the Tsiu River and over a hundred miles northwest of Yakutat. Johnson said they were curious about how it died and wondered if the recent trend of warmer ocean temperatures was a factor. He said they took the tuna back to their camp at the Tsiu River fish buying station. But someone else — rather, something else — had other ideas. Nicole Zeiser, assistant area management biologist for the Alaska Department of Fish and Game in Yakutat, said she took a few pictures of Johnson’s fish before it disappeared. “Strangely enough, this is the second one since I’ve been up there on the river,” Zeiser said. She also has pictures of a much larger yellowfin tuna was caught two years ago closer to the mouth of the Tsiu River. Zeiser said she didn’t see any hook marks in the mouth. 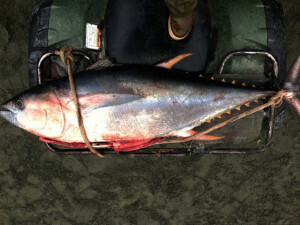 Zeiser said the yellowfin tuna may have weighed 80 pounds. She recalls that another skipjack tuna was also caught nearby in 1981, the northernmost ever spotted at the time. 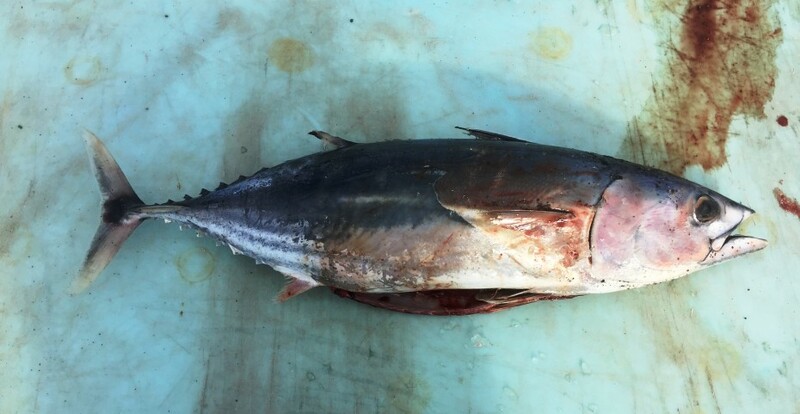 It’s unclear whether a developing El Niño in the equatorial Pacific is partially responsible for this year’s wayward skipjack. Scientists are also monitoring another warm water anomaly nicknamed The Blob that has persisted in the Northeast Pacific for over a year. There have been reports this year of pilot whales returning to California waters, opah off Oregon, and prickly fanfish and slender snipefish in Oregon and Washington waters. The CBC is reporting that The Blob could be responsible for recent sightings of triggerfish, butterfish, tope sharks, sunfish, and louvar off the coast of British Columbia. Sunfish and market squid have also been spotted in Alaska waters.